Turned into admiring mosaic, they love to make everyone feel special! But the one they love the most gets all the affection. CONs: Now you will feel good to be the one who is loved the most. 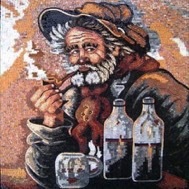 This beautiful tile mosaic art was made by hand to fit any office, retail space, home or garden. Our mosaics are made from natural marble and stones, naturally resistant to different environments (dry, moist or wet) and weather conditions (frost, sunlight or extreme heat).